Update: The Nvidia Shield is available starting today in the US via Best Buy, Amazon and through Nvidia's online store. Also announced at Google IO, Shield will support HBO Now and Sling TV, as well as apps for CBS, FOX, Vimeo and Twitch. Nvidia revealed that it will be packaging consoles with $30 in Google Play Store credit and three months of Google Play Music. Unfortunately for the UK and other regions, all we have is a vague "coming soon" release date. Nvidia has been teasing a product that's been years in the making, and now we know what it is - a set-top box that wants to become the centrepiece of your living room. 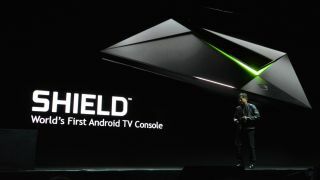 Named the Nvidia Shield, the box will sit next to your TV and, running on Android, will offer high-end gaming and entertainment for the living room. This, Nvidia eagerly tells us, is the world's first 4K Android TV. Designed to be the ultimate all-in-one device, Shield will let you browser through games, movies, YouTube videos, music and other media. With the box comes a remote with one-click one-touch voice search button. There's also the option to plug headphones into the remote if you want some private viewing time. But Shield isn't just for the casual entertainment lovers - it's also made for serious gamers. "A set top box should also be able to game," said Nvidia President Jen-Hsun Huang. The console is powered by Tegra X1, meaning it massively overpowers rivals like the Amazon Fire TV and Apple TV. It can deliver twice the performance of an Xbox 360 and at one fifth of the power, said Huang. You'll be using Nvidia's Shield controller as your gamepad, which can run for 40 hours on a single charge. Like the remote, that's also itself loaded with a built-in mic to give you voice control from the sofa. Nvidia will be using its new Shield Store as a home for all of its games, with 50 titles set to be ready for launch. Gearbox's Randy Pitchford took to the stage at GDC to show Borderlands: The Pre-Sequel running on Nvidia's new baby, where it will be available to buy from launch day. Crytek also came on to shows us that, yes, it can run Crysis 3, which is being ported over to Android for the arrival of Shield. Other launch titles include Doom 3: BFG Edition, Portal, Half-Life 2, Borderlands 2 and The Talos Principle. So let's talk money. The Shield will only cost $199 (about £129, AU $255) for a 16GB version and $299 (about £195, AU $390) for a 500GB version, and you'll get a controller bundled with that when it ships this today in the US with other countries to follow shortly. What else is going down at Google IO?